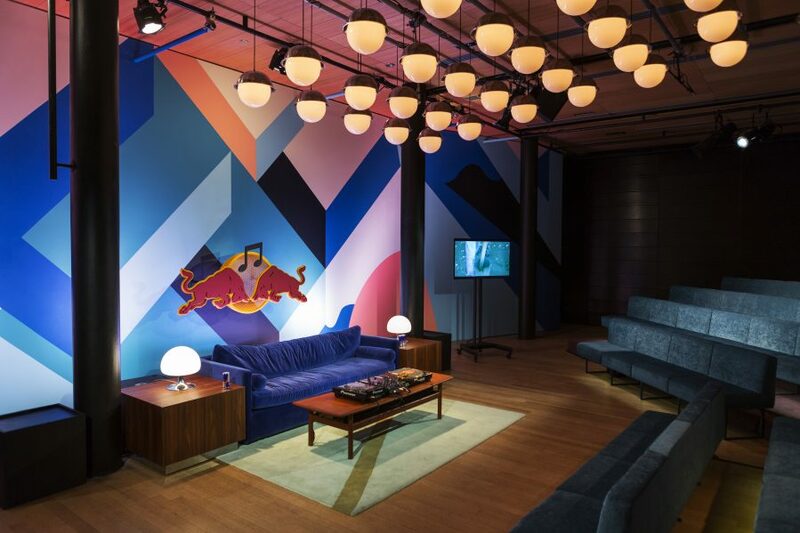 Every year since 1998, Red Bull Music Academy (RBMA) has set up shop in an iconic city and hosted a five week workshop and concert series for music’s most creative minds: instrumentalists, DJs, and producers, selected from thousands of applicants from around the world. In October, the drink company brought their energy to Montreal, and tapped Zébulon Perron + Associés to transform the Phi Centre into a welcoming space where participants can learn and feel at home. No matter how long visitors spent in the Academy space, it was designed to imbue them with a sense of permanence. This lived-in feeling was achieved through accents Perron has shown in previous Montreal projects such as the Parc Avenue wine bar La Buvette Chez Simone and the Jewish bakery Hof Kelsten: vintage pieces and furniture constructed from salvaged materials; and a humanizing of industrial interiors, using materials such as aged wood. In keeping with the Academy’s aim of fostering collaboration, each element of the space – from the 10 custom-fitted recording studios to the RBMA Radio studio, lounge, reception area and lecture hall –was designed to act as a conduit for the exchange of ideas. Aesthetic coherence was achieved through the use of ambient light, vivid colours and seating arrangements that serpentine through each room, encouraging face-to-face interaction. Plants were a key design motif; 770 varieties of overgrown, diverse tropical greenery in every room brought in the natural world. The Phi Centre was a perfect choice as the main venue for this rockin’ enterprise. Founded by artist, actor, gallerist and entrepreneur Phoebe Greenberg in two restored heritage buildings, Phi Centre houses facilities for recording, mixing and film postproduction, and a virtual reality garden. Programmed concurrently with the five-week RBMA festival of concerts, club nights and public talks, an art exhibition in the Centre included works by 22 Montreal-based artists ranging from traditional painting and sculpture to digital mediums such as video, 3D animation, sound and kinetic works, and all connected by the theme of radical materiality – a shared interest in the role of perception and the innovative use of materials and technology.